First-half strikes from midfielders Tom Rogic and James Forrest had the Parkhead club's 100th trophy win all but guaranteed by the interval. Striker Moussa Dembele confirmed that achievement when scored from the spot in the 64th minute after Forrest was felled by Anthony O'Connor inside the box and the rest of the game was a formality for the champions who did not have to reach top form to take the first piece of silverware of the season. 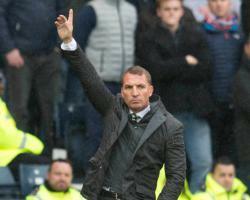 Although Rodgers has been at pains to play the prospect down talk of a domestic treble since taking over the club in the summer Celtic can with some confidence - they are clear at the top of Ladbrokes Premiership and still to feature in the William Hill Scottish Cup - make that their next target. Aberdeen, for their part, will simply have regroup after an afternoon of frustration where they failed to reach the high heights required to challenge a formidable Parkhead outfit. As expected Hoops winger Scott Sinclair failed to shrug off a hamstring complaint and he was replaced by Patrick Roberts and although Leigh Griffiths returned from a tight hamstring but had to settle for a place on the bench, while Forrest replaced Callum McGregor. Dons boss Derek McInnes drafted in defender Ash Taylor for striker Jayden Stockley who started among the substitutes. Confident noises had emanated from the Pittodrie camp in the build-up to the game but they were not backed up by any real substance. Celtic were first to threaten in the 13th minute when overlapping left-back Emilio Izaguirre found Moussa Dembele with a pinpoint cross from the left but the France under-21 striker's close-range header was parried by Pittodrie keeper Joe Lewis with Andrew Considine getting the ball to safety. However, the keeper was three only minutes from conceding the first of the afternoon. Jozo Simunovic advanced from defence to find Rogic at the second attempt - Kenny McLean's challenge on the Hoops defender lacked conviction - and the Australia international turned inside Graeme Shinnie and from 18 yards curled his shot into the far corner past the flailing Lewis. It was his third goal in the three matches against the Aberdeen this season. The Dons did have the chance to level moments later when midfielder James Maddison's free-kick found the head of Considine but his header from eight yards was parried to safety by Parkhead keeper Craig Gordon. However, that near miss was as close as the Granite City men came to levelling. Forrest fired just inches past the post from 25 yards in the 36th minute after Roberts attacked the Dons defence. However, the Scotland international was more accurate two minutes later when he drove into the opposition penalty area and despite the attention, eventually, of three Aberdeen players, he drove low past Lewis for number two. The Dons required a remarkable turnaround but Celtic stood firm in the face of a red and white flurry just after the break, defending several corners and crosses into the box with determination and hope slipped away. O'Connor's last contribution was to trip Forrest in the box, allowing Dembele to slide in the penalty for his 17th goal of the season, and he was immediately replaced by Stockley, with Nir Bitton on for Roberts. The green and white ribbons were being prepared for the trophy as Celtic midfielder Stuart Armstrong somehow missed the target from 12 yards after being set up Forrest on a Parkhead counter-attack. Aberdeen were dispirited but the Celtic half of the stadium sang their heroes home, the final whistle bringing a roar of approval for the century landmark.